Preheat oven to 350 degrees F. Bake meatballs 25 minutes. Fifteen minutes in, slice each roll (not all the way through); add to lower oven rack. Bake until toasted, 5-10 minutes. Meanwhile, in saucepan over medium heat, melt the butter. Whisk in flour; cook until bubbly. Whisk in milk, Worcestershire sauce, salt, and pepper. Increase heat to medium high. Cook until thickened, stirring often. 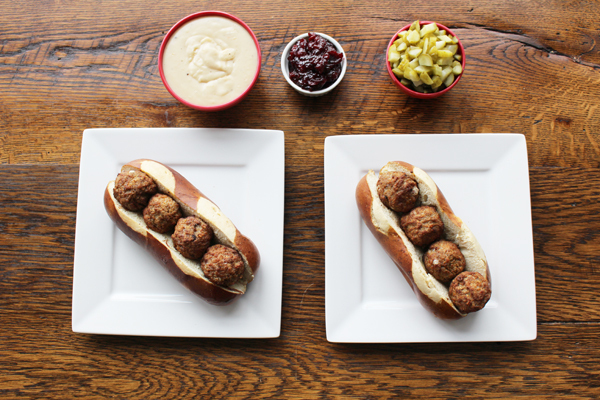 Assemble the subs: divide the meatballs, gravy, pickles, and preserves among the 4 rolls and serve.